I know, I know. GF, TB… what the hell? Everything these days is abbreviated. No one speaks real words anymore. We’re all too BUSY! ON THE MOVE! No time for such nonsense as WORDS and LETTERS. And no time for homemade dinners apparently. Which is just silly to me. Look, we’re all busy. Everyone’s busy nowadays. We create our own busy – a different kind of busy than our parent’s had. We now have social media, and texting, and who knows what else that takes up all of our allotted time. But that’s just the way of this world. I know I’m not as busy as the busiest person on the planet, but we all have our battles to fight everyday. And for me, one of the things on the top of my to-do list everyday, no matter how crazy the day is, is a homemade meal for my family. That’s my priority. I know it’s not everyone’s. But it is mine. Which, I suppose is why I have this here blog. 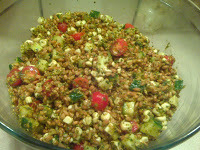 And this recipe is very easy, very healthy, and very tasty. It’s Spaghetti and Meatballs. 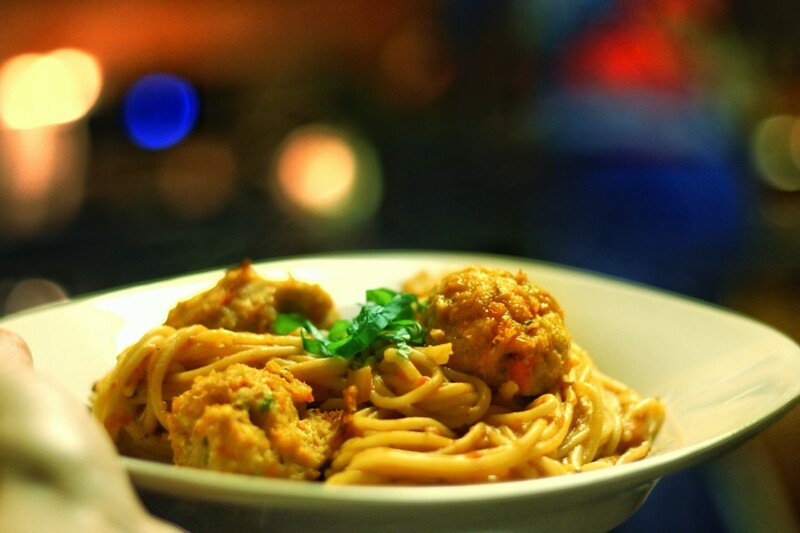 Everyone loves Spaghetti and Meatballs. This is just a healthier version of it, and the very best I have ever, ever made. Which is why I’m posting such a basic meal recipe that you can find on any website on any given day. This one is the one you need to bookmark. Bold statement. Yes. And I stand behind it 100%. 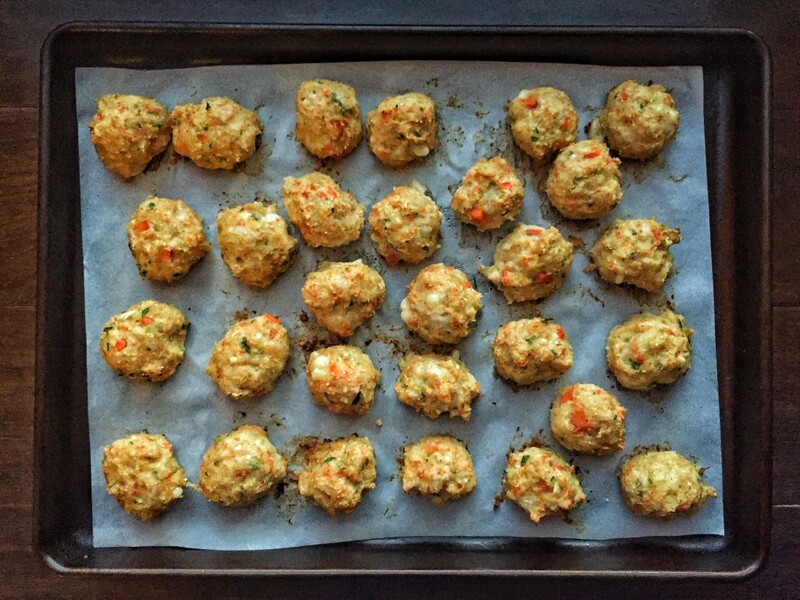 I’m using ground turkey breast in the meatballs- (not by choice, really… it’s just what I happened to have on hand when I set out to make meatballs)-a normally very dry and fairly flavorless type of meat, but I make sure you get a TON of flavor and moisture- all from good sources. And the pasta is my family’s new favorite store-bought noodle. It’s gluten free, pretty high in fiber and protein… and we’re not even gluten free. Have I got your attention? Good. I should have it. Season well with kosher salt. Cook until softened. You don’t need to brown them, you only need to sweat them out. Cook for another minute or so, then as long as everything is softened, turn off the heat. If you want a smoother meatball, blend these veggies until you get a paste. Otherwise, transfer them now to a large mixing bowl. But either way, make sure the veggies are cool before you continue mixing. Roll into walnut-golfball sized balls (I use a small cookie scoop for even balling) and place on a parchment lined baking sheet. We love making pasta at home, but who doesn’t love having a dried noodle to grab in a pinch? And this stuff right here is amazing!! I love wheat. But I also love anything healthier that doesn’t sacrifice flavor. 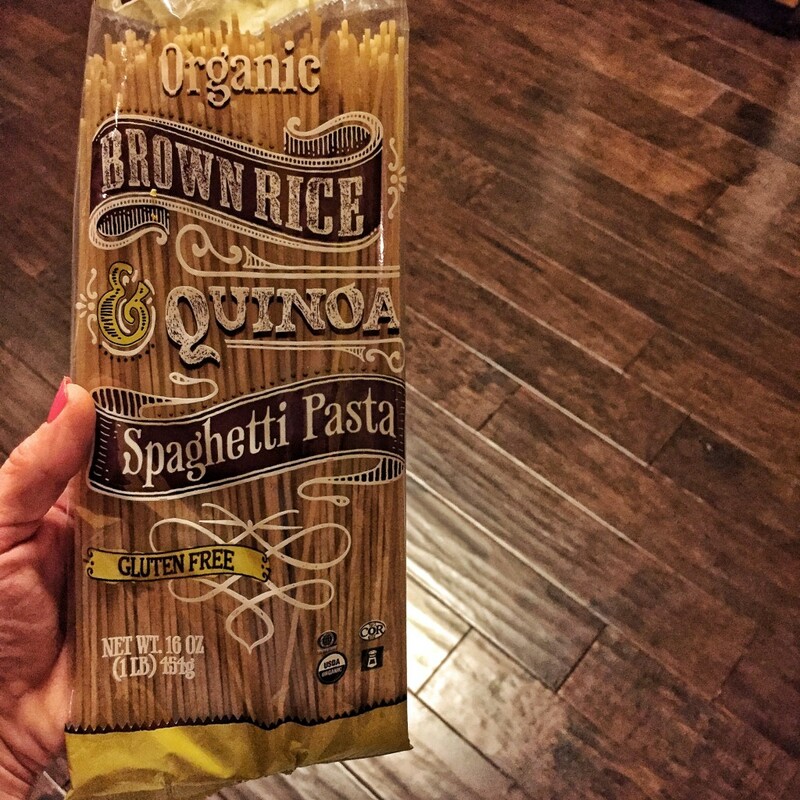 This pasta, made by Trader Joe’s, is made primarily of brown rice flour mixed in with quinoa to make an incredible pasta substitute for those of you who can’t tolerate gluten. Trust me. It’s the best non-semolina, healthy pasta I’ve ever, ever had. And I’ve tried a lot of different pastas. Toss cooked pasta with your meatballs and your favorite red sauce. You will need about 3 cups marinara/red sauce (which is a standard 24-25ish ounce jar if you’re buying it). Simmer, covered, for several hours. Remove all solids, if desired- puree slightly until the large tomato pieces break down to your liking (but keep some chunkiness to it) and you’ve got red sauce. Garnish each plate with torn or finely chopped fresh basil and more parm. …It should be noted that in the background of the finished plated image up above is my son, in Superman PJ’s, grating more cheese into the pot ;-).